With some films, the troubled story of their making is far more interesting than the finished products. Reading about the background to The Long Ships, I’m left wondering how it managed to make it to the screen in any cohesive form at all. In truth it’s a mess of a picture, no denying that, though it isn’t without entertainment value and there’s lots to recommend about it, but I think about the problems it experienced throughout its production and find the fact we have a movie to enjoy at the end of it all to be approaching a minor miracle. The industry is full of such instances, of course. Cleopatra‘s a famous example of endless production problems, and I’ve recently been watching Hearts of Darkness, a chronicle of the ‘what could go wrong did go wrong’ making of Apocalypse Now, and as with The Long Ships I’m amazed there wasn’t a point where they didn’t just give up and go home. The reason was obviously money, too much invested to stop them from calling a halt, yet I end up admiring these people who exhausted themselves to the point of suffering breakdowns in getting the job done. If the finished films aren’t masterpieces, then there’s a point of accepting that we’re simply lucky to have something. The Long Ships was made in an attempt to surf the wave of popularity for historical epics, most notably The Vikings, indeed it plays like a clash of the peoples from that Fleischer film and Anthony Mann’s El Cid in pitting Norsemen against Moors. There’s actual historical precedence for meetings between these two very different races, as the Vikings made incursions into Moorish Spain in the tenth century, only to be repelled. Accuracy wasn’t the first point of order for the production, however; neither was a desire to remain faithful to its source material, Frans Bengtsson’s two part novel that weaved the fantastical tale of the race and rivalry between both sides to acquire a fabled treasure. 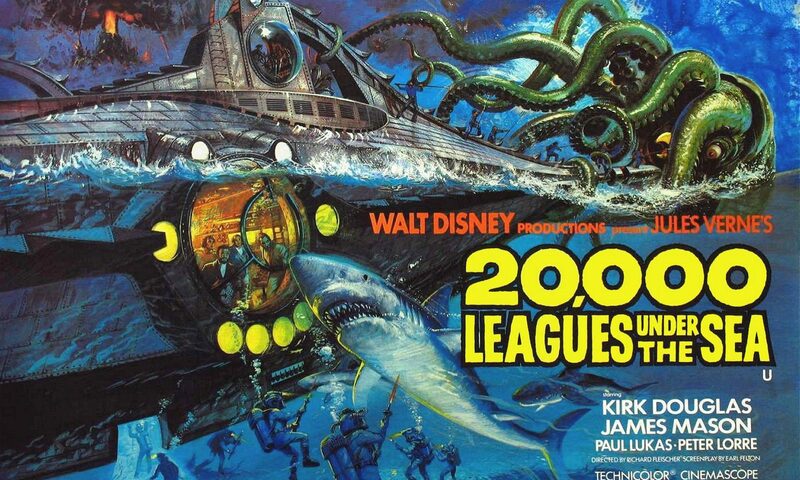 The rights to the story were acquired by Irwin Allen, who hired famed cinematographer Jack Cardiff to direct it. The choice of Cardiff seemed logical enough, given his astonishing and evocative photography for The Vikings, and the aim seems to have been to emulate that film’s success. Cardiff later related that he thought the job would be much easier than it would turn out to be, believing it wouldn’t be so different from his experiences shooting The Vikings. Big mistake. Tito’s Yugoslavia was behind much of the film’s investment, with the production running from a studio in the Communist country. The hope was that it would encourage better relations with the West, but working there was a difficult experience. Sidney Poitier, already an Oscar winning actor and expecting star treatment, found Belgrade to filled with loathing towards him following incidents of locals clashing with African students brought in on scholarships. Richard Widmark, who was signed to play the ‘Kirk Douglas’ role, arrived with his own problems and demands, calling for nothing less than a complete rewrite of the script. This almost led to Cardiff’s departure from the production, before Widmark was persuaded that the new screenplay was a complete farce and they returned to the original. Both lead actors had an unhappy time during the production, Widmark threatening to walk out due to clashes with Allen, and there’s something about these problems that is reflected in their performances. Widmark and Poitier act their parts as though they’re appearing in entirely different films. The latter, appearing as Moorish King Aly Mansuh, sports an incredible bouffant and plays it straight, lending his character a degree of solemn nobility, whilst Widmark comes across as a light-hearted adventurer, almost a comic performance. He plays Rolfe, a Viking marauder whose ship is wrecked off the coast of Africa. Destitute and left to sing for his supper, he’s earning a pittance by recounting tales of an enormous church bell moulded from solid gold. By chance, Aly Mansuh has been pursuing the bell all his life and captures Rolfe, demanding that he gives up the location. The Viking escapes before he can be made to talk and eventually makes it home to his father, Krok (Oskar Homolka). The family’s ruined thanks to Krok’s building of a funeral ship dedicated to the king, but Rolfe steals the boat alongside his brother, Orm (Russ Tamblyn), and a crew, with a mission to head back to Africa and find the bell, which he believes he has heard ringing and therefore knows its location. But the Moors are never far behind, and eventually their paths will lead them to seek the object together, with an air of mistrust making their mutual cause an uneasy alliance. The plot’s rambling and a number of characters are really short-changed. Tamblyn, who’s third billed, gets very little to do and is forced to wear a costume that appears to have forgotten it needs a bottom half. A storyline that involves a kidnapped Viking princess amounts to virtually nothing, and there’s little better in store for the gorgeous Rosanna Schiaffino who plays Aly Mansuh’s favourite wife. Widmark and Poitier dominate the proceedings through sheer force of will and possible script rewrites that brought them both to the fore, at everyone else’s expense. Homolka’s role seems to demand only that he laugh hysterically at everything, as though Krok is stumbling through the entire film in a drunken stupor. Despite everything, and there’s a lot of ‘despite’ in The Long Ships, it’s very good fun, maintains a fast pace for a two hour film and has no trouble using liberal amounts of gore (largely implied, but it does stretch the boundaries of its certification). One Moorish method of execution, a killing machine called the Steel Mare that forces the victim to slide down the length of a sharp blade, is rather blood-curdling and needs to be seen in order to be believed. Cardiff’s involvement ensures the whole production looks ravishing, its modest budget belied by some beautiful photography. It also benefits from a lovely opening sequence that narrates the legend of the bell. Designed by Maurice Binder, of 007 credits fame, it has monks shown in silhouette sourcing and crafting the bell, and it’s wonderfully done, if tonally different from anything that follows. But then that nicely describes the entire movie, a messy collage of scenes and images that come together fitfully. It isn’t consistent, but neither is it uninteresting. Widmark and Poitier would go on to star together in the following year’s The Bedford Incident, a far more interesting, relevant and cohesively told Cold War film that better represented the strengths of its performers. In contrast, The Long Ships feels like what it is – a dumb fun adventure yarn, one that is spoken of negatively by those who were involved in it, and when you consider the production difficulties and somewhat sloppy outcome that isn’t a surprise. It was a victim of poor timing, audiences’ love for historical epics on the slide by this point, which only adds to the sense that the cast and crew would rather forget that it had been made. However years later, when this doesn’t matter and we can enjoy it on its own merits, it’s a surprisingly decent watch, rambling, silly and uneven to be certain, but not without some merit. I certainly found it an easy way to pass two hours, and when I think about the other films I mentioned that experienced troubled productions – Cleopatra and Apocalypse Now – that’s saying something. I remember this film, although The Vikings is much stronger in my memory. It’s a shame such films aren’t made as often today. My love of film really started with films like this – historical epic adventures. El Cid is another great film from that era. Thanks for commenting Daniel, and welcome to FOTB! I really love THE VIKINGS, and think my own start in film watching was very similar to yours. The craze for epic cinema had ebbed by the time this one came out and in any event it isn’t anywhere near as strong as the best entries, but it’s still pretty good stuff. I suppose I could make the argument that with TV series like VIKINGS doing the rounds, they actually are still making this kind of stuff, though I agree it isn’t the same. It has been decades since I saw this last and I suspect it was cut and panned and scanned on ITV one rainy afternoon in my youth. You really made me laugh with that comment about Tamblyn’s costume Mike though this may hardly constitute much of an inducement! Now, if we were talking about Schiaffino … Have you seen NO WAY OUT, the first pairing of Poitier and Widmark, from 1950? Well worth a look. Thanks Sergio – no I haven’t seen NO WAY OUT, but that will change as it looks completely fascinating, also Linda Darnell. 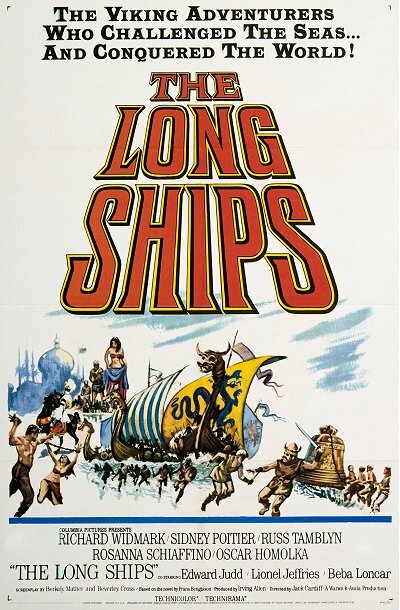 Happily this version of The Long Ships I watched on DVD is a solid one, and nicely so as it’s a very good looking film, if a bit dodgy otherwise. I’m pretty sure I bought this on DVD years ago but never got round to watching it. I’m keen to do so now but I’m pretty sure it’s back at my parents’ place so that won’t be happening in a hurry. Oh well, I can wait. It’s been ages since I saw this too and remember only odds and ends – the spectacular execution method always stuck in my mind though! I do recall it feeling like a bit of a hybrid picture, not a really serious epic and almost too muddled to be a wholly effective adventure yarn. BTW, I’ll second Sergio’s recommendation of No Way Out. Thanks Colin. The ‘hybrid’ element I imagine comes from the chaos of its production, lucky we got anything at all really. And you’re right, that execution scene stays in the memory long after everything else has faded, it looked terrifying!